A viewer spots a Blue Island building with an image of three chain links on its facade. Geoffrey Baer has the scoop on the odd fellows behind that insignia, and explores a South Side building that housed fancy ice cream and fancy carriages. The building at 13035 S. Western Avenue says IOOF at the top. What was it? The building our viewer is asking about in the south suburb of Blue Island was originally built as a meeting hall for the fraternal organization the Independent Order of Odd Fellows – and it’s not the only one around town. The organization has its origins in 17th century England. According to the organization, the name came from their opinion that it was odd to find people organized for the sole purpose of helping people and benefiting mankind, so they named themselves the Odd Fellows. 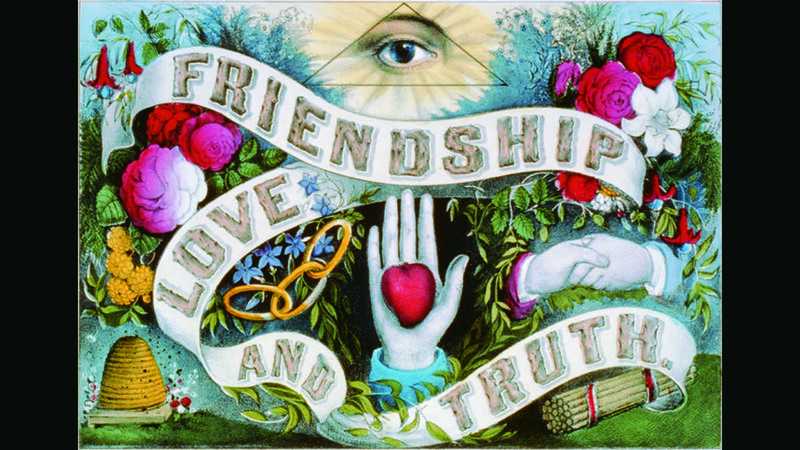 The three links in their logo are meant to embody the group’s motto of “Friendship, Love, and Truth” and you’ll spot it on some of the old lodge buildings. They also had plenty of regalia and symbolism in their practices, much like the Masons and the Elks. The organization moved stateside to Baltimore in 1819, where Washington Lodge No. 1 was formed with a declared mission to “visit the sick, relieve the distressed, bury the dead, and educate the orphans.” The first Chicago lodge was dedicated in 1844, and by 1923 there were 89 Chicago lodges with nearly 28,000 members – big enough that some lodges built their own places to meet. As we mentioned earlier, the meeting houses left their mark on Chicago’s streets. A few include what is now the DANK Haus German American Cultural Center on North Western Avenue, built as an Odd Fellows Lodge in 1927; a 1908 lodge in Logan Square on Wrightwood is now a day care; and a 1918 lodge in the Old Irving Park neighborhood is today apartments and retail. And oddly enough, there’s a piece of Odd Fellows history from New York in Chicago. The owner of the graphic design firm Segura in the Noble Square neighborhood bought this wrought iron gate from an architectural salvage company. It’s from the Abraham Lincoln Lodge #20 in New York, a Jewish lodge, which is likely why the German name for the lodge is on the gate. The Odd Fellows almost contributed what would have been a quite prominent 34-story building designed by Adler & Sullivan to the downtown landscape as well – you can read all about it at Chicagology. While their membership isn’t where it used to be, there are a still a few lodges in and around Chicago where odd fellows can meet to do good work – you can find the lodge closest to you at their website. There is a large brick building on the corner of Pershing and Michigan that looks like it may have been some type of factory. What’s the story on it? It’s a storage facility now, but the Bronzeville building has been home to two pretty notable businesses. It was briefly a factory that made electric cars. No, not Teslas! These were made between 1910 and 1913 by the C.P. Kimball Carriage Company. Kimball had originally constructed the building in 1892 as a factory for horse-drawn carriages. The Kimball family was a carriage-building dynasty dating back nine generations to the 1600s in New England. They were also famous for their sleighs. The family opened its Chicago branch in 1876 when Charles Porter Kimball moved from the East Coast to take over a failing carriage manufacturer here. And while it was obviously not a business that was destined to last forever, they did thrive for decades. In the early days of the automobile they found a niche building finely crafted car bodies and tops for the chassis built by other companies like Cadillac, Marmon Packard and Peerless. C.P. Kimball must have had some enthusiasm for the coming of the automobile, though, because he served as one of four judges in what is considered America’s first automobile race in November 1895, a grueling trek from Jackson Park to Evanston and back. Six cars started only two finished. It took the winner 10.5 hours. The company did briefly make its own automobile, the Kimball Electric, but only for three years. The company went out of business in 1929. A few years after Kimball went out of business, the building became home the Goldenrod Ice Cream Company. The company was started by Louis B. Olin, the son of a Lithuanian immigrant. Goldenrod moved into the Michigan Avenue building in 1937; Olin named the company after the Illinois state flower. Their most famous brand was a luxury ice cream called Vala’s. It was advertised as “obscenely delicious” and “the world’s most expensive ice cream.” Each pint was hand-packed by women who added ingredients like whole nuts, layers of fudge and chunks of fruit. They would stamp the pint with their name, so your butter pecan would say “hand-packed by Ruth” on the bottom. But it was only a few years before the expensive hand-packing gave way to automation, and not long after, Goldenrod was acquired by Bresler’s Ice Cream in 1976. Two fun side notes: Two of Louis Olin’s great-grandsons went on to success in the film industry – actor Ken Olin and director Chuck Olin. The Olins and their in-laws the Sang family are also widely known in Chicago’s Jewish community for the summer camp named for them, the Olin-Sang Ruby Institute or OSRUI, in Oconomowoc, Wisconsin. Note: This episode of Ask Geoffrey originally aired on May 16, 2018. Did you know that you can dig through our Ask Geoffrey archives? Revisit your favorite episodes, discover new secrets about the city’s past, and ask Geoffrey your own questions for possible exploration in upcoming episodes. Find it all right here. Do you have a question for Geoffrey? Ask him.